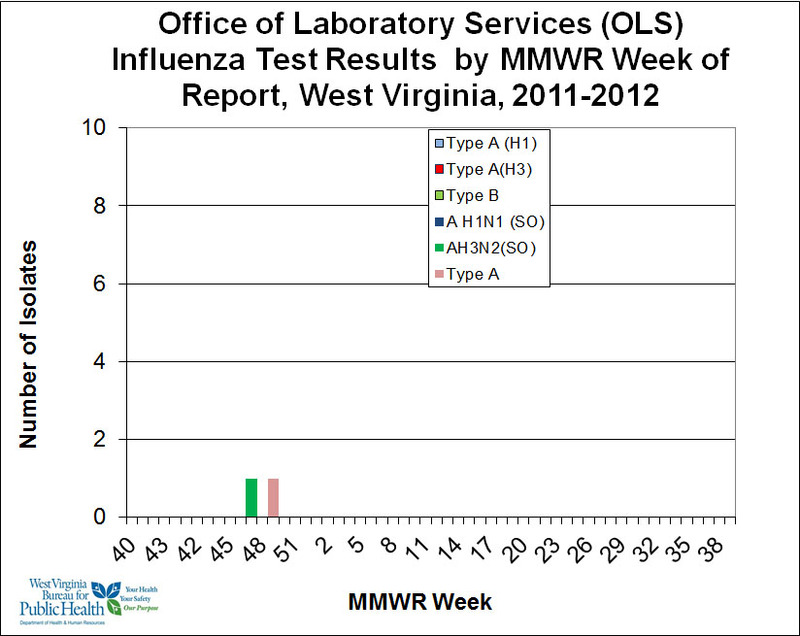 The above chart list the first two confirmed influenza cases in West Virginia in the 2011/2012 season. The first case listed (week 47) is the novel trH3N2 case, A/West Virginia/06/2011, while the second case (week 49) is an epidemiologically linked case that has produced a weak influenza A signal and is under investigation at the CDC. If confirmed and closely related to the first case, it would raise the number of novel influenza cases in West Virginia to two out of two PCR confirmed cases. This result is remarkable similar to Maine, which also has two confirmed cases (A/Maine/06/2011 and A/Maine/07/2011 in weeks 41 and 43, respectively) and both are H3N2pdm11. Although the two Maine cases are not epidemiologically linked, the partial sequences from ME/07/11 are virtually identical to ME/06/11, signaling human to human transmission. Although the two Maine cases attended the same agricultural fair (Fryeburg) which had symptomatic swine, the swine tested negative for SOIVs and the fair ended two weeks prior to disease onset, eliminating the swine at the fair, including those in the pig scramble, as sources of the H3N2pdm11 detected in the second case. Thus, the sequence data supports widespread H3N2pdm11 in humans, not swine. Human transmission was confirmed in the cluster in Iowa. Three cases were confirmed and the two latter cases were epidemiologically linked to the index case. Moreover, the sequences from all three confirmed cases were virtually identical for all 8 gene segments (the number of nucleotide difference between the sequences from the index case and each of the sequences from each of the linked cases was 0 or 1). In additional, the brother and father of the index case were symptomatic, but not tested. Similar clustering was noted for the trH1N2 case in Minnesota, A/Minnesota/19/2011. A symptomatic contact was noted, but the confirmed case was identified by routine surveillance of an isolate, which led to a delay in confirmation, and the absence of testing for the symptomatic contact. Thus, all confirmed novel cases in children this season are linked to confirmed or suspect clusters based on epidemiology or sequence analysis. As seen in the above figure, the number of confirmed cases in West Virginia is limited to the two confirmed or suspect cases, which is also the situation in Maine. Thus, the “limited transmission” seen in the novel cases also applies to seasonal flu cases, which have not been detected in either state. Thus, the lack of detection of sustained transmission, may be a function of the assays and viral RNA at this time of the year. Low levels lead to milder cases and false negatives. However, in spite of these limitations all of the recent confirmed cases, in Maine, Iowa, Minnesota, and West Virginia, are linked to other confirmed or suspect cases, signaling efficient and sustained transmission.